Battery sulfation remedies have been around for over a century. The technology has changed but the ultimate objective has not. It is extraordinarily difficult to make any real money out of ideas that have been around this long. Competition is fierce, margins are low. High time for a completely different approach. Batteryvitamin L is designed to greatly slow down the wearing-out process that occurs specifically in industrial motive power batteries, (positive grid corrosion accompanied by sludging of the positive active mass, followed by loss in ampere-hours). Batteryvitamin works by physics at a nanoscale level, (explained in detail, in plain language on other pages). 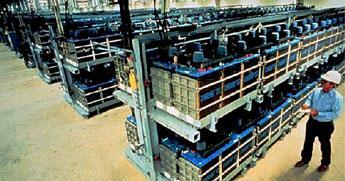 Batteryvitamin typically adds 40-60% to the service life of hard working industrial motive power batteries. One part of Batteryvitamin concentrate in 125 parts battery refill water. New and in-use batteries. Why do motive power batteries deliver only about 1500 deep cycles, yet load leveling batteries seem to be able go on and on for 3000 deep cycles? There does not appear to be that much difference in their design and construction. Nevertheless, they are not identical. The natural rubber separators preferred by knowledgeable battery operators for load leveling batteries possess a unique property - known in the trade as an ability to reduce antimony poisoning of the negative plates. We investigated this in some considerable detail. This has been done many times before by the battery industry, apparently unsuccessfully. We tried many different approaches. The antimony that was poisoning the negatives had migrated there from the positives, so we reasoned that we should be looking at battery cells as electroplating cells - albeit very, very inefficient electroplating cells. After that, everything fell into place. 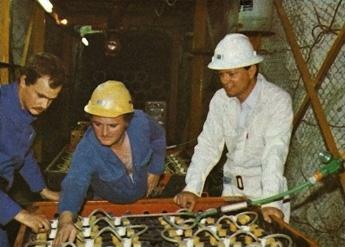 We knew that additives in electroplating baths migrate to and are adsorbed onto the negatives. We succeeded in identifying the performance enhancing component. We analyzed the material's physical properties and synthesized equivalent materials with the same physical properties, although not chemically related. Finally, we developed improved versions, superior in every way to the material we had isolated, able to cut down grid corrosion to a bare minimum. improves battery life expectancy 40 - 60 percent. On average 2 out of every 3 lead-acid batteries that go into service are replacements for worn out batteries. Motorists strapped for cash can be relied upon to want to consider the alternative to buying a new battery - reviving their old battery. This is what kick-started sulfation (Brit. sulphation) cures in the first place and has been sustaining multitudes of bring-back-to-life remedies for as long as the lead-acid battery has been an item of commerce. There are thousands of desulfation merchants competing for a finite pool of customers who do not have enough money to buy a new battery. Desulfation has become a highly competitive, cut-throat line of business. The industrial motive power battery business is very different. The users of these batteries are very different. The money involved is very different. The average retail price for a full-plate-count, non-discounted automobile battery is $110, (£68). The average price for an industrial motive power battery is $3500, (£2200). Selling industrial motive power batteries is potentially 32 times more attractive, per battery, than selling automobile batteries. The total value of automobile batteries in use worldwide was $57 billion in 2010 and industrial motive power batteries $11 billion. The automobile market appears to be 5.18 times more attractive than the industrial motive power battery market. Automotive is, however, a hotly contested line of business, subject to aggressive price cutting. These are, nevertheless, useful numbers that can be used to calculate a figure of merit for an industrial motive power battery related business start-up. Divide 32, the sales price advantage of motive power batteries, by 5.18, the market value advantage of automobile batteries. Less than one means best left untouched. Greater than one speaks of opportunity. Six is excellent. Motive power batteries are rarely used alone or in small groups - are mostly used in groups of sixty, four hundred, a thousand batteries, per facility. In the UK, Asda, Morrisons, Sainsbury's, Tesco and Waitrose together run over 120 distribution warehouses, each has in the order of 200 motive power batteries powering forklift trucks, stackers and other types of vehicles. In the USA, Walmart, Kroger, Target, Costco, Home Depot, Wallgreen, Safeway, Amazon, (Click for distribution center details), etc., together run several thousand distribution warehouses. Logistics operators, industrial concerns, food and beverage manufacturers, etc. run many hundreds of similar large operations. Bear in mind that it is about helping corporate battery users to make up their minds they prefer the savings they can make from batteries that last longer to the extra expense of buying or leasing new batteries. 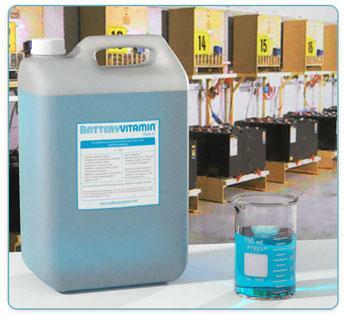 In 2000, Batteryvitamin was installed for the first time at a large facility, a 950 battery auto manufacturer parts distribution warehouse. A typical, smaller 400-battery warehouse can account for an investment in batteries of 400 X $3500 = $1.4 million, (£875 thousand). Extra 40% service life represents a saving of $560 thousand, (£350 thousand). The price the customer would be asked to pay for the service can be a ten-twenty percent portion of the saving. Multiple installations, repeat business, minimal overheads - a potentially handsome line of business. A people oriented, marketing and sales, slightly actuarial, technical service line of business. It is essential that we provide you with comprehensive technical disclosures. 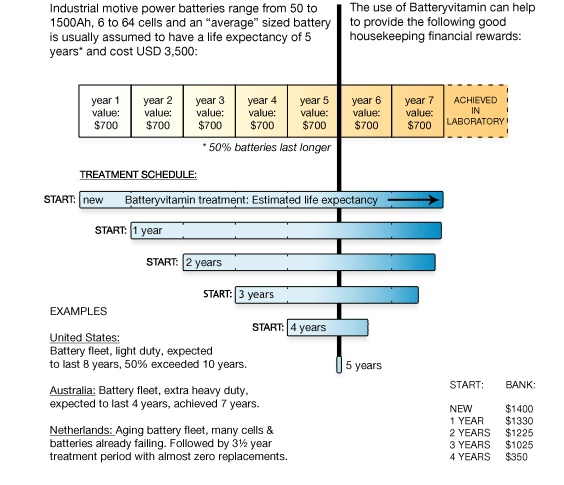 Our INTRODUCTION page provides Batteryvitamin application highlights. Our TECHNICAL INFORMATION page provides precise details of the technology. There are more than 20 pages with technical and general information on this website. What we propose is a very simple business model. We provide technical support and product, follow up service - you provide marketing and distribution - under an exclusive-territory distribution/ licensing agreement.